Novel methodological concepts to simulate pervasive policy-driven transformations were for the first time tested in a real-world case study application to analyze policy targets associated with the city of Shanghai’s goal of having more electric vehicles on its roads by 2025. The IIASA Transitions to New Technologies (TNT) Program’s pioneering agent-based modeling approaches, which extend the model representation of dynamic technology landscapes by a corresponding representation of networks of interacting producers and users of technologies, reached a new milestone in 2017. Following extensive model development and illustrative test simulations where the new type of model served primarily as a research tool, it was possible for the first time to calibrate the model with empirical data for a case study in the city of Shanghai. By combining detailed statistics on vehicle registrations and an innovative application-based consumer survey (albeit with a limited sample size), researchers were able to test the agent-based modeling method in terms of how well it could reproduce the historical rapid growth in the vehicle market of the city. In addition to this, the researchers were able to explore policy options for a policy target scenario of one million electric vehicles in the city by 2025. This work is based on a long-standing successful collaboration with researchers from the East China University of Science and Technology (ECUST) in Shanghai. Calibration of historical vehicle market growth in the city of Shanghai with an agent-based model developed by an IIASA-ECUST research team. 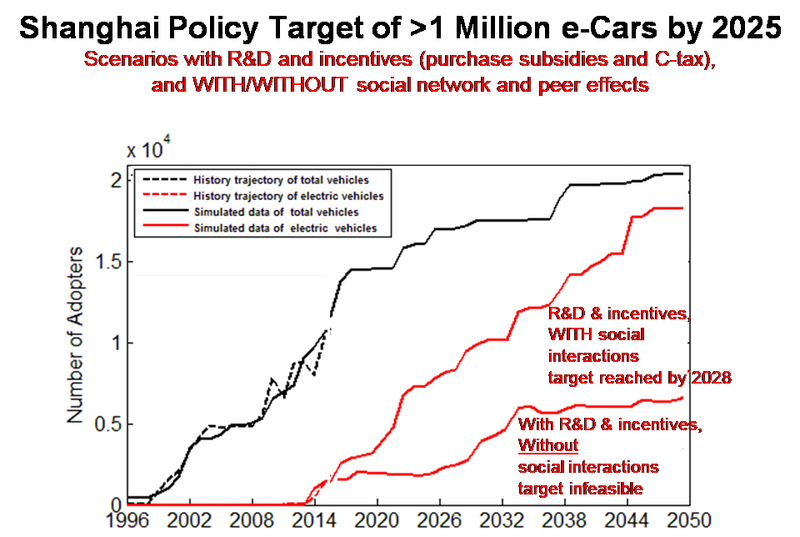 Also shown are the simulated impacts of technology push policies only, and an integrated approach including demand-pull policies leveraging social network and peer effects. In the latter case, the examined policy target of one million electric cars registered in the city might become feasible by 2028, indicating a case of very rapid transition. First results from the study suggest that this highly ambitious target could be feasible if technology innovation push and social/behavioral pull strategies are combined to change consumer preferences, while maintaining the already highly substantial economic incentives for electric road vehicle purchases. Given this encouraging initial result, a large scale, fully-fledged policy study was initiated. In collaboration with researchers in Israel–who have pioneered novel methods for consumer surveys in new business applications like shared- and electro-mobility–collaborators in China are currently preparing a new, larger scale survey. Research will also continue to extend the agent-based model with an energy systems component that will enable the detailed examination of the resource conservation potential from shared mobility models, as well as the possibility of using a large number of electric vehicle batteries as electricity storage. Bento N, Wilson C, & Anadon LD (2018). Time to get ready: Conceptualizing the temporal and spatial dynamics of formative phases for energy technologies. Energy Policy 119: 282-293. Zhang S, Ren H, Zhou W, Yu Y, Ma T, & Chen C (2018). Assessing air pollution abatement co-benefits of energy efficiency improvement in cement industry: A city level analysis. Journal of Cleaner Production 185: 761-771. Fang C & Ma T (2018). Technology Adoption Optimization with Heterogeneous Agents and Carbon Emission Trading Mechanism. In: Integrated Uncertainty in Knowledge Modelling and Decision Making. Eds. Huynh, VN, Inuiguchi, M, Tran, D & Denoeux, T, pp. 238-249 Cham, Switzerland: Springer. Chen H & Ma T (2017). Optimizing systematic technology adoption with heterogeneous agents. European Journal of Operational Research 257 (1): 287-296. Wilson C, Kriegler E, van Vuuren DP, Guivarch C, Frame D, Krey V, Osborn TJ, Schwanitz VJ, & Thompson EL (2017). Evaluating Process-Based Integrated Assessment Models of Climate Change Mitigation. IIASA Working Paper. IIASA, Laxenburg, Austria: WP-17-007.